Alright. This is beginning to worry us. We have won every softball game since the start of the season. Sure, that is something we can be proud of; but that would get us bumped up to the Open Division. We are good; yet not that good! And we can't just start to throw games, that would be poor sportsmanship. Mind you, if they stick me at shortstop for the remainder of the year, I'm sure that would solve the problem (we'd probably lose every game). So, after another win, it was time for food. My favourite part of softball! Actually, it's my favourite part of hockey and golf too! Since we were in the Oakridge area, we took the short jaunt into Richmond. For once, I was not forced to follow someone going at 30km/h, get cut off, have my parking space taken away from me or see a full-faced visor. Ah, a relaxing visit to Richmond. I was really at peace with myself. 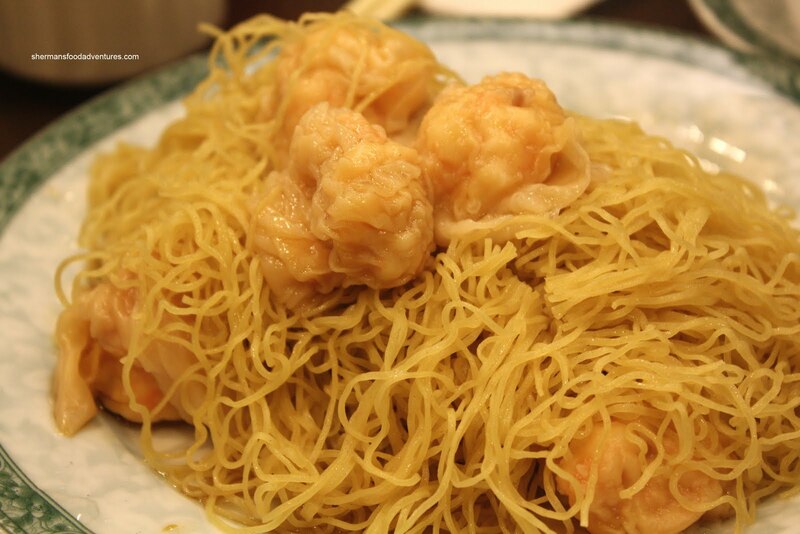 Unlike last time at Cafeteria, where not everyone was full from their meal, I decided that the good ol' wonton noodles would be a cheap alternative. 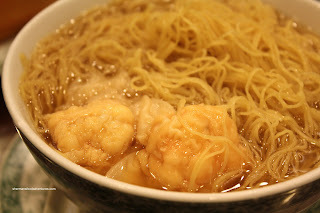 Thus, in my ongoing quest to find the best wontons, we headed over to Michigan Noodle. Since I was the only person who could speak Cantonese at the table, everyone looked to me when we needed to order. That usually isn't much of a problem; but I often have issues "changing channels". You see, when I'm in English mode, I can't readily change to Cantonese without sounding like Chinglish. I did my best and everyone got what they wanted, so there must've been "subtitles" for the waitress I suppose... Seeing how this place is known for their Wonton Noodles, I got a bowl. Strange that I was the only one to order this. Maybe everyone is catching on to not double-up on items when we order food. The noodles were indeed very good. They were thin while being chewy. 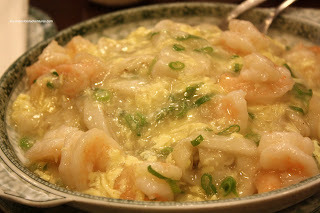 I liked the soup, it was very flavourful with a strong shrimp taste and a tad gingery. The wontons themselves were not very big, although the all-shrimp filling was crunchy and had hints of sesame oil. Boss Woman had her go-to item in the Egg Swirl with Shrimp on Flat Rice Noodles. When it arrived, it drew some reaction since it was quite large. Topped with plenty of large, properly-cooked shrimp, the dish was a winner. We also ended up sharing a plate of the Brisket and Tendons. The dish was a flop. We felt the brisket was not all that tender, bordering on stringy while the tendons were woefully overcooked. They were practically melting on the plate. 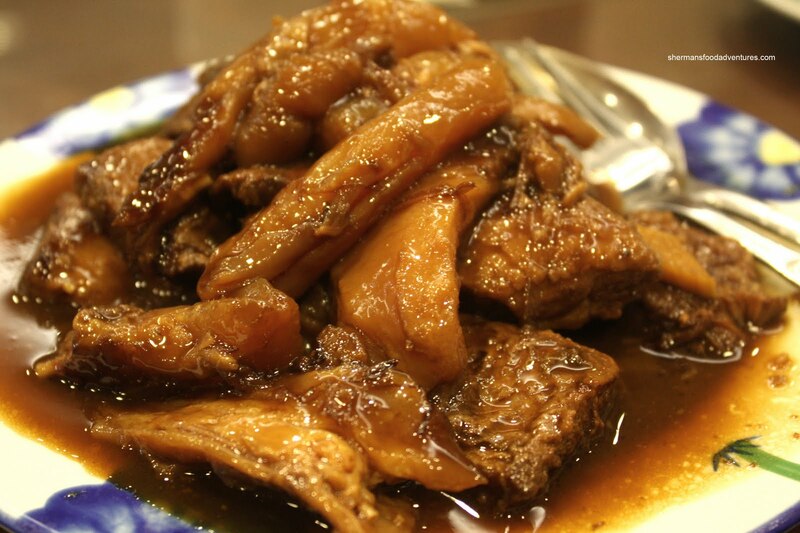 Flavourwise, it was too salty with very little distinguishing flavours such as star anise or ginger. If that wasn't enough, I also shared a Preserved Duck Egg & Salted Pork Congee and a Salty Donut with Milhouse. I must say that the congee was pretty darn good. 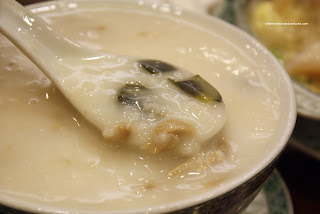 With a perfect thickness, the congee was a nice balance of sweet & salty. The salted pork had a nice "bounce" texture while not being too salty. We only wished that they didn't cheap out on the preserved duck egg, we could bar ely find any. Now, as for the salty donut, it was excellent. 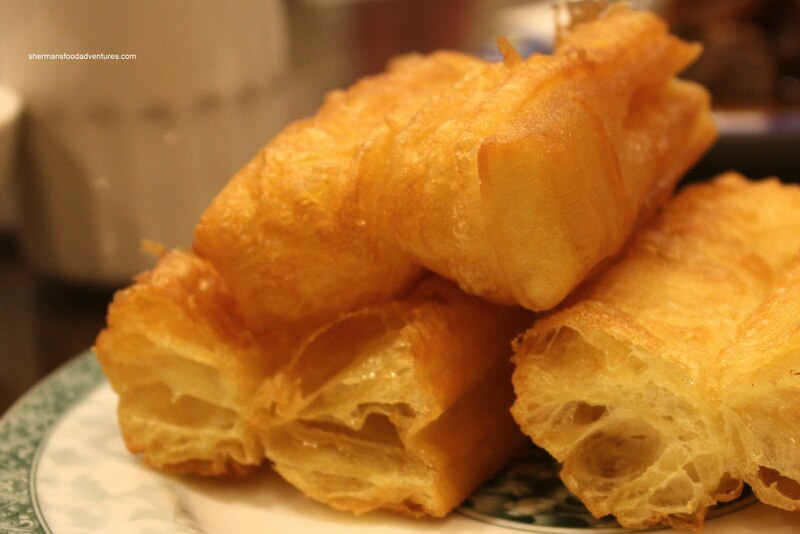 Freshly fried, it was both airy inside and crisp on the outside. It held up real well when dipped into the congee. If they had tried draining or soaking up the oil from the donut, it would've made it perfect. 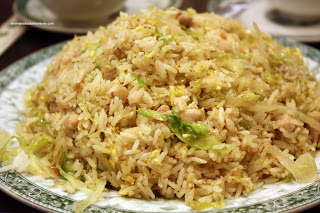 Milhouse then ended up sharing a plate of the Salted Fish & Chicken Fried Rice with Bear. Yes, it was an accounting nightmare when it came time to pay... Anyways, the plate of rice was solid. There were no clumps of rice and the texture itself was chewy. There was a nice balance of flavours too despite the presence of salted fish. It was just salty enough with a touch of sweetness and ginger. For himself, Bear had the Brisket Lo Mein while Judes had the Wonton Lo-Mein. Lo Mein is essentially dry wonton noodles tossed with sesame oil (sometimes oyster sauce as well). It can be served as is or come with a topping of some kind. Bear and Judes liked the texture of the noodles, they were chewy with a nice "bite". Bear didn't complain about the brisket, so maybe his was more tender. Judes like the wontons, much like I did. She did agree that they were on the smaller side. For the items that we ordered, they would be considered to be smaller "quick" dishes. However, Michigan serves up full set Chinese meals as well with full-size entrees. I noticed that many of the tables were having that over the items we ordered. That would indicate those set meals are pretty popular. We were curious about that and it is probably a reason for a return visit. In the meantime, we were pretty satisfied with the wonton noodles, congee, fried rice and fried noodles. 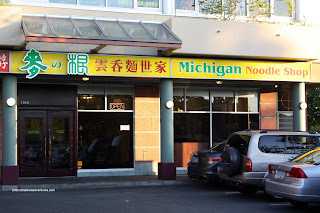 If I needed to make a comparison, Michigan is similar to McNoodle (makes sense since the owners used to be partners with them) in terms of noodles and wontons, albeit bigger portions. The story that I heard behind McNoodle and Michigan is this. The owners of McNoodle (formerly Maks) used the same name as Mak's Noodle in Hong Kong (quite a famous noodle house), even though they were not affiliated, hoping to steal the goodwill associated with the name. When the operators of Mak's in Hong Kong decided to come to Richmond, they could not use Mak's since that was already taken. Instead they became McKim's Wonton Mein Saga. McKim's is associated with Michigan. The logo's are similar if not the same. The name Michigan was chosen because the Cantonese pronunciation sounds close to McKim's or Maks. Having eaten at Mak's in Hong Kong as well as Michigan, I would have to say they are very similar. Mak's noodles are cooked a bit better, while Michigan has bigger wontons. 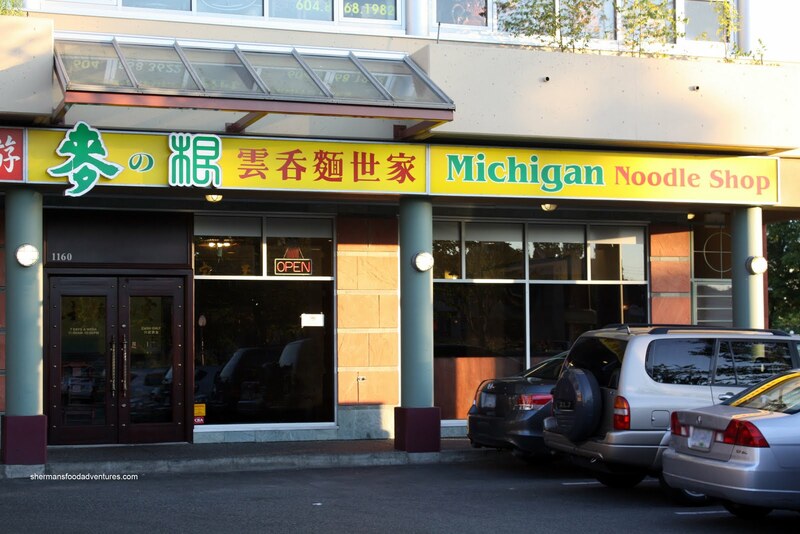 Michigan was always one of our favourites for noodles, before we figured out it's pedigreee. Wow, do you seriously eat out every night of the week? Milo, thanks for the info. I heard something similar, but not as detailed as that. We had excellent service at Michigan when we ate there a few weeks ago. We were also lucky enough to get parking out front. Must be doing something right :-). Grayelf, the service was alright, it just wasn't accessible... I guess they were busy?